When you're inspired by The Tree of Life, it's safe to say that you'll deliver an influx of nature-based patterns and prints. Shaikah Noor and Shaikha Haya of Noon By Noor delivered on that. Their first looks were fresh and sophisticated and did indeed take us to a tropical place. The white palm tree print dress and the purple sweetheart strapless jumpsuit will be the right types of pieces for a polished springtime debut. That was just the beginning of their showcase. 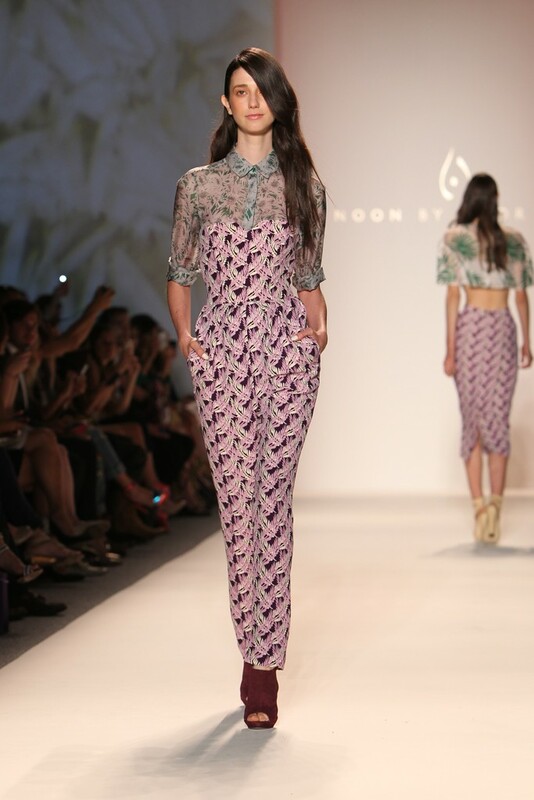 Prints came in long dresses, softer colors and layered looks that worked together in a harmonious way. They also had their way with rosettes and peplums, turning up the notch by combining them together and making them work as a standalone on eveningwear, outerwear and even on the most darling mini navy high waist shorts. More dressed up looks included a rich purple leather high waist skirt paired with a cream balloon sleeve blouse and a gorgeous blush cocoon coat with lace panel detailing. Learn more at Noon By Noor.